a pediatric mannequin with nurses from the Emergency Department. 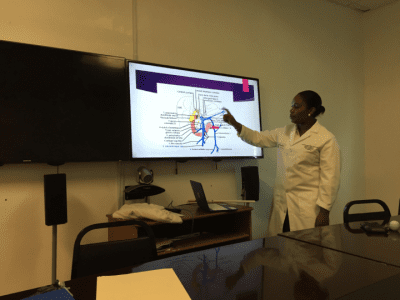 In October 2014, University Hospital of Mirebalais welcomed six residents into the first and only emergency medicine residency program in Haiti. A second class of six residents entered in the fall of 2015. Together, these young doctors proudly carry the responsibility of advancing emergency care in their country. It hasn’t taken them long to see the program’s benefits. In September 2015, a child was brought into the emergency department after ingesting a toxic amount of iron that would have killed him had he not received emergency care. With guidance, the residents successfully treated the boy and he was able to go home the next day. In November, a patient arrived at the emergency department after being involved in a car collision. Though his physical exam suggested that he was fine, a resident performed an abdominal ultrasound (FAST exam) that showed free fluid in the patient’s abdomen. The emergency department (ED) team convinced general surgery to take the patient – a lifesaving decision, it turned out, because the patient ended up having a ruptured spleen. That patient survived chiefly because the residents have learned to perform a FAST exam on all trauma patients regardless of how well a patient may appear to the naked eye. for the Program in Social Change and Global Surgery. In December, a 16-year-old girl arrived at the ED with severe asthma. With support, the residents were able to not only stabilize her condition, but to creatively engineer mechanisms for emergent treatment, as well as long-term solutions. The girl recovered well, and was discharged a few days later. In January 2016, a woman who had given birth three days earlier came into the emergency department with severe respiratory distress. She was diagnosed with postpartum cardiomyopathy, a rare condition in Canada but one that can be all-too-frequent and devastating in Haiti. Dr. Duneant, with the help of Dr. Cassandre Edmond, put the patient on mechanical pressure support ventilation for her respiratory distress and medications to treat her heart volume overload. Also in January, a seven-year-old boy was admitted for swallowing a sharp object that had perforated his esophagus and was obstructing his airway. He received an emergency tracheostomy, was given antibiotics and fluids, and was transferred to surgical care. The residents are motivated every day by successes like these. 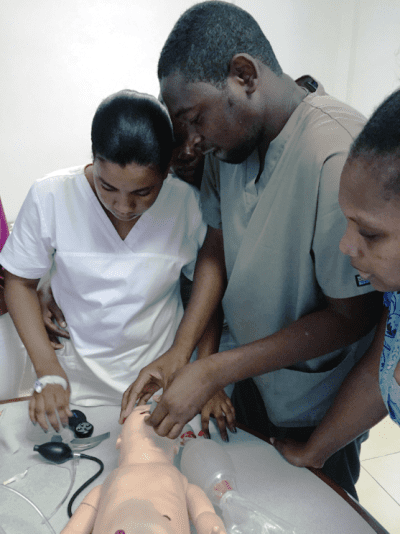 Every achievement draws attention to the overwhelming challenges that they face every day as health care professionals in Haiti, but also to what can be accomplished with proper resources and training. Pictured on front page banner: 2015-16 PGY-1 Emergency Medicine residents (left to right): Drs. Pierre Ricot Luc, Roody Ménager, Philippe Dimitri Henrys, Laura Marcel, Claudy Joseph, and Dyemy Dumerjuste.